I pay careful attention to my grammar and punctuation here. I know that my blog is not error-free, but as my friend Tahoe Mom says, everyone needs an editor. Unfortunately, this individual blogger doesn’t have access to an editor. Still, I do my best. Lately I have been thinking more than usual about punctuation. In particular there are three punctuation marks to which I pay particular attention: commas, explanation points, and semicolons. Commas — There was a time when I overused commas. I don’t believe I do so as much anymore. I do take care to remove commas that on second reading seem unnecessary. Exclamation Points — I am strict in limiting my use of exclamation points. I never allow more than one exclamation point in a paragraph, and for the most part, only one exclamation point per blog entry. Semicolons — Semicolons are tough. I rarely use them. American grammar dictates that semicolons link two independent clauses. (So the section on semicolons in Eats, Shoots and Leaves really grated on me, because British grammar allows a semicolon to separate a dependent clause and a related dependent clause.) It’s very rare in my writing that I find two independent clauses that are so closely related that they merit a semicolon. My rule is: when in doubt create two separate sentences. Which is almost always. In the process of digging up an electronic copy of our household philosophy for yesterday’s blog entry I came across a page I did for my Pitzer College reunion in 2000. The class of 1975 was asked to do a page that reflected our current thoughts and values. That was because in 1975 we had a yearbook in which each senior was given a page to express themself however they chose. I was struck by what has changed for me and what has not changed. I included this picture of me. 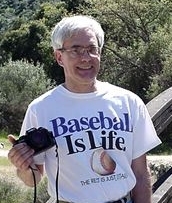 Terry and I were on a hike, and the t-shirt I wore while holding my camera said, “Baseball is life. The rest is details.” The caption beneath the picture read, “Important things in life: baseball, hiking, and photography” I’m sure Terry and I staged that specifically for the page. Today we don’t hike much because of Terry’s knees, I don’t do anywhere near as much photography as I used to, and I follow baseball, but not with an intense interest. Beyond our household philosophy (which also appeared on the page) and time spent with Terry and Tasha, these days I’d probably list my three important things as writing this blog, cooking, and reading books on my Kindle iPad app. Every day and every Sunday we celebrate the politics of God in the Eucharist—one table where everyone is welcome and there’s food for everyone: a subversive table, stirring up our longing for liberty. Today the Eucharist is as central in my life as it ever was, as is the importance of being inclusive at that Table. Many things change. Some don’t. 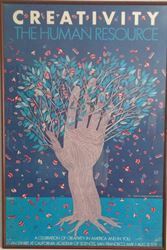 I have been very consistent for several years now, publishing blog posts at the same time each evening, five days a week. But life is changing. We are getting ready to sell our house, and a huge amount of work and effort has gone into that. We have been to Southern California to get the lay of the land with respect to what is available there and have found a community we like. Our realtors here will be taking over management of our house as staging happens on Monday and listing on Wednesday. So here’s the thing: I can’t commit to that schedule, at least for a while. I plan to blog regularly, but my daily at-the-same-time-each-day cadence may or may not continue. I will keep up Sacred Music Friday as best I can, keep you current in what is happening in our lives, and hope to have some time for reflection as well. I hope you understand, and I hope you’ll keep dropping by to see what I have to say. As Bartles and Jaymes used to say back in the 1980’s, thank you for your support. So we begin the first full week of the new year. And I begin another year of blogging. One thing I’ve noticed of late is that I’m trying to avoid rants. One blog entry sat in my drafts folder for over a month until I was able to turn a rant into a more considered reflection. I had one blog entry that was most definitely a rant in my head, but as I started typing it came out as a more reasoned line of thought. I hope that is becoming a pattern. I don’t know what this blog will look like in 2015, aside from attempting to avoid rants. I can surmise, however, that I will discuss topics much like those I have addressed for the past several years. There will be entries on liturgy, spirituality, and religion. I will no doubt write about cooking and my favorite cooking shows on television. I expect to continue with the book reviews. And Sacred Music Friday will certainly continue. Whatever I end up writing about this year, I hope you will continue to join me. I love having you along. There are a few tools I have used intermittently in writing this blog. One of them is Grammarly, which is an online grammar checker. I have used it off and on, but have for the most part been unhappy with the advice it has given me. A year ago my subscription was up but they offered me an attractive price so I renewed. I used it very little in the past year. I was not aware that I was on auto-renew, so I was annoyed when a renewal charge hit my credit card recently. Before writing to complain I decided to give it another try, since it had been a while since I had used it. I used it on a few blog entries and I was not pleased with the results. While it did catch a couple things, a lot of the advice was either wrong for the context or just plain wrong. Grammarly also has a habit of telling me to add commas. I need to delete commas from my writing, not add more. I have to give the good folks at Grammarly credit, however. I explained the circumstances and they have cancelled my account and reversed the charge on my credit card. The second is the Writer’s Diet Test. This one is my favorite. The philosophy of the Writer’s Diet is very much in alignment with mine: that all other things being equal, lean is better. It measures for verbs (forms of to be), nouns, adjectives/adverbs, and waste words (it, this, that, there). It measures on a scale from “lean” to “heart attack territory,” with “fit and trim,” “needs toning,” and “flabby” in between. I really like this tool, and it has helped me to improve some of my blog entries. At the same time, it can be aggravating. Sometimes I’m writing about something that just is, and I am explaining about what it is and what it does. In such cases, to replace forms of to be with other verbs is to risk sounding affected and pretentious. While useful, it is not perfect. A third tool is the Online Consistency Checker. It exists to promote the products developed by Intelligent Editing, but it is a nice little accessory. It reads a Word document and checks for things like spelling variation and consistency in hyphenation. I love this. I channel my creativity through this blog. For many years I also had a creative outlet in photography. What I realized a few years ago, though, was that I was so busy out in nature trying to get the right shot with my camera that I was failing to experience the moment. So I scaled back on my photography and began focusing even more on writing, which means I look back and reflect on the moment after it has passed. I think that’s a good thing.